The Customer Service Driver of an organization takes charge of transporting the goods from the place of purchase or origin to the place of the customer. The main responsibility of the Driver is to make daily deliveries to various stores and customers throughout the day. The other tasks of the customer service drivers are to load and unload the goods, check for the package, follow traffic rules, inspect and maintain vehicle condition, delivery at the correct address, maintain a log of delivered goods and ensure the loads match with the shipping documents. 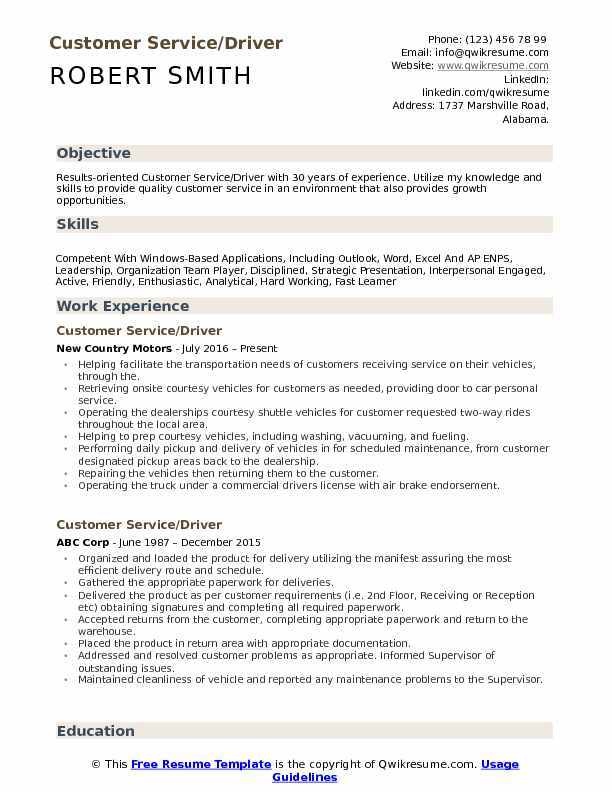 Those seeking to work as customer service driver need to demonstrate in their Customer Service Driver resume sample high level of safe driving skill, time management, safety track record, and communication ability and customer service skills. The educational requirement for this post seeks High school Diploma with a valid Driving license. Summary : Results-oriented Customer Service/Driver with 30 years of experience. Utilize my knowledge and skills to provide quality customer service in an environment that also provides growth opportunities. Helping facilitate the transportation needs of customers receiving service on their vehicles, through the. Retrieving onsite courtesy vehicles for customers as needed, providing door to car personal service. Operating the dealerships courtesy shuttle vehicles for customer requested two-way rides throughout the local area. Helping to prep courtesy vehicles, including washing, vacuuming, and fueling. Performing daily pickup and delivery of vehicles in for scheduled maintenance, from customer designated pickup areas back to the dealership. Repairing the vehicles then returning them to the customer. Operating the truck under a commercial drivers license with air brake endorsement. Organizing the space in the warehouse and performing the cleaning duties to ensure a safe work environment. 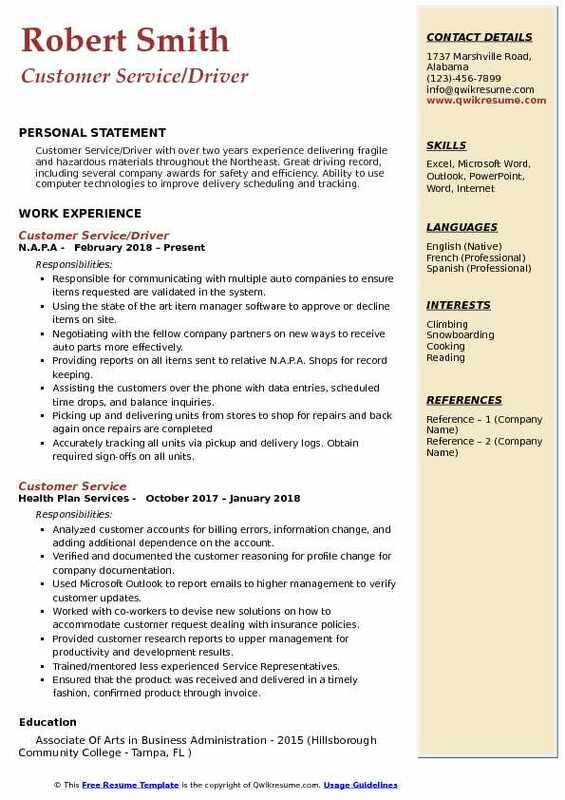 Objective : Self-motivated and energetic Customer Service Driver seeking employment to integrate interpersonal skills in order to build strong teams within the work environment. Distributed and delivered products to food distributors, grocery stores, and warehouses. Traveled approximately 2000 miles per week which required overnights. Accurately plotted pre-determined locations in a timely manner ensuring timely deliveries. Conducted preventative maintenance before, during and after all trips. Maintained all dot driving regulations and guidelines resulting in no accidents. Provided daily records (by use of scanning equipment and logs) for all deliveries and pick up ensuring accuracy and timeliness of all information. Reported any loss or damage specimens immediately to lead or Supervisor. 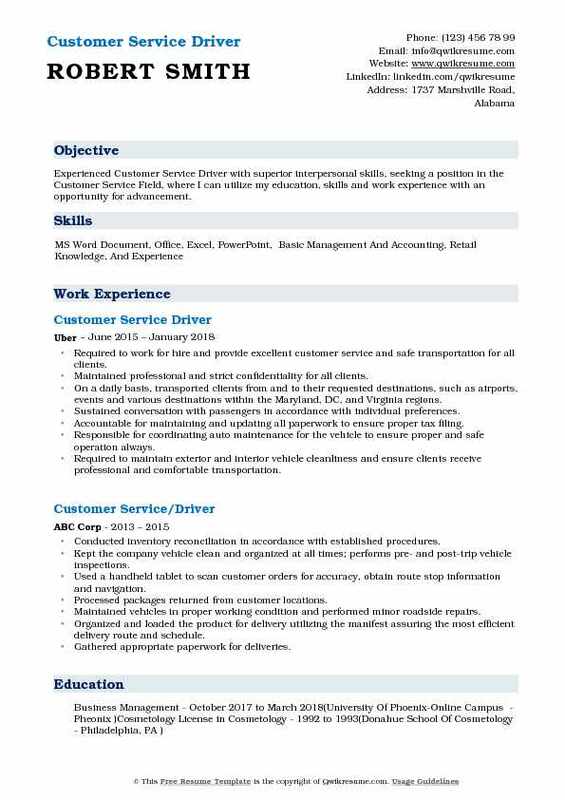 Objective : A customer oriented and excellent Junior Customer Service/Driver possesses 4+ experience as Customer Support Executive. Excellent in conveying the client's requirement to the team leader. Excellent in converting the cold calls into a new assignment. Expertise in taking follow up on daily basis. Expertise in working with a team. Efficiently collected and transported various passengers and individuals from their pick up points to their respective destinations with complete safety. Looked after the completion of working schedules as specified by the local transportation authorities, which were for regular routes and other for casual routes. Assisted other drivers and senior transport drivers in deciding and planning the traveling routes and considering the passenger needs, least traffic conditions, etc. Skilled in handling special logistics and looking after the route planning process. Capable of providing exceptional customer service and looking after the advanced security protocols. Objective : I am a dedicated Customer Service Driver, with 4 years of sales and customer service experience who can be relied upon to help your company achieve its goals. Advising the customers on substitution or modification of parts when identical replacements are not available. Examining the returned parts for defects, and exchange defective parts or refund money. Marking and store parting the in stockrooms according to prearranged systems. Discussing the use and features of various parts, based on knowledge of machines or equipment. Reading the catalogs, microfiche viewers, or computer displays in order to determine replacement part stock numbers and prices. Maintaining the proper inventory levels and product distribution for vending machines. Performing product rotation to ensure freshness at designated client locations for vending machines. Providing the client and customer satisfaction in every aspect of job performance. Objective : Jr. 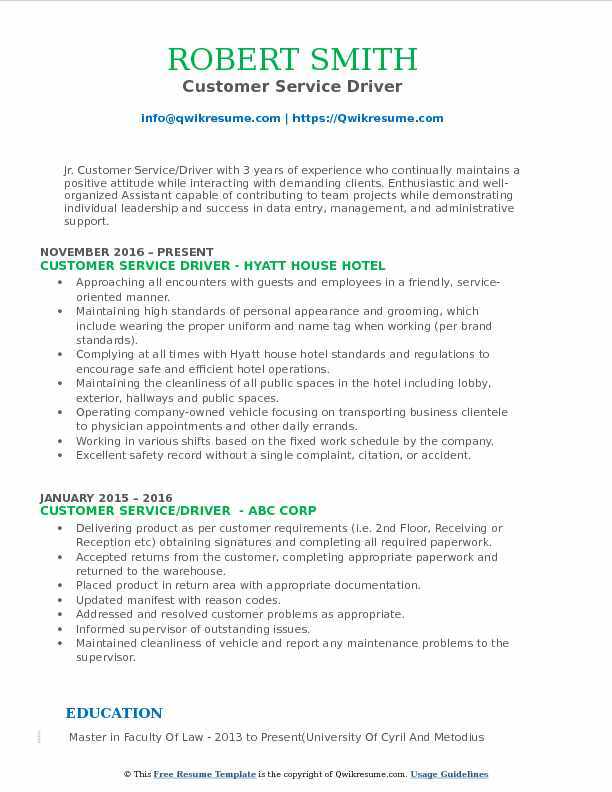 Customer Service Driver with an objective is to obtain a position in a professional environment where my skills are valued and can benefit the organization. I also would like to gain long-term employment with a company that puts a value on its employees. Using the handheld data collection devices to record product unique codes, accurately enter unique price(s), and appropriate attributes based on individual client collection criteria. Operating, monitoring, and maintaining all deck equipment. Transmitting the data collected on the day of collection, with accurate work date. Developed a solid customer base and continuously target new customers using techniques from CME training. Willingly performing all responsibilities as required or assigned by the Superior. Creating a fun professional work experience while promoting the companys products and services. Operating Class B commercial truck to perform daily route shredding services for all businesses and residential customers in a timely manner. Servicing and delivering new bins and consoles to customers on an as-needed basis. 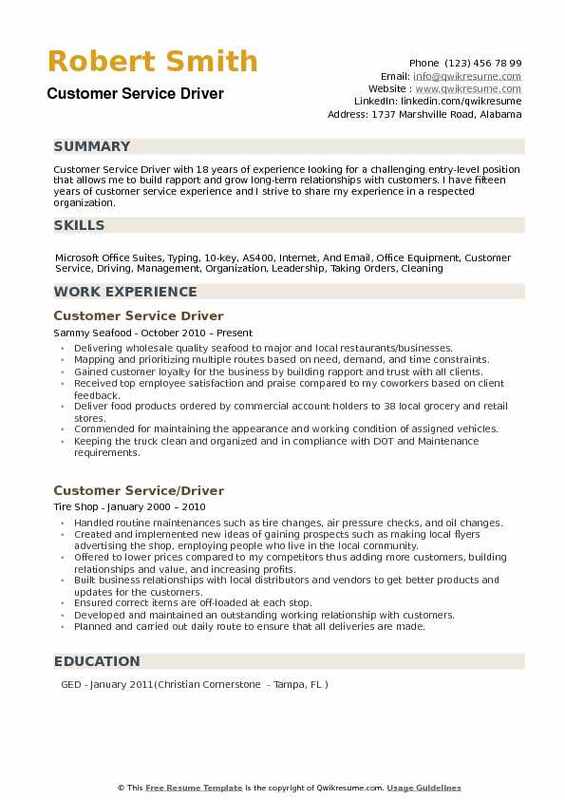 Headline : Experienced Customer Service Driver with superior interpersonal skills, seeking a position in the Customer Service Field, where I can utilize my education, skills and work experience with an opportunity for advancement. 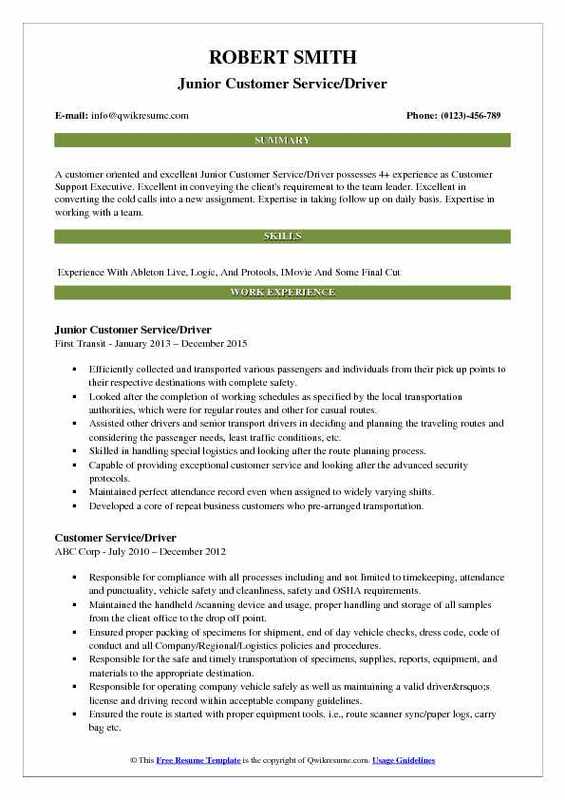 Required to work for hire and provide excellent customer service and safe transportation for all clients. Maintained professional and strict confidentiality for all clients. On a daily basis, transported clients from and to their requested destinations, such as airports, events and various destinations within the Maryland, DC, and Virginia regions. Sustained conversation with passengers in accordance with individual preferences. Accountable for maintaining and updating all paperwork to ensure proper tax filing. Responsible for coordinating auto maintenance for the vehicle to ensure proper and safe operation always. Required to maintain exterior and interior vehicle cleanliness and ensure clients receive professional and comfortable transportation. Knowledge of computer automotive maps and general knowledge of the DC area is required and thorough knowledge of traffic laws and regulations. Maintained an unfailingly professional and courteous attitude in demanding and difficult road situations. Objective : Jr. Customer Service/Driver with 3 years of experience who continually maintains a positive attitude while interacting with demanding clients. Enthusiastic and well-organized Assistant capable of contributing to team projects while demonstrating individual leadership and success in data entry, management, and administrative support. Approaching all encounters with guests and employees in a friendly, service-oriented manner. Maintaining high standards of personal appearance and grooming, which include wearing the proper uniform and name tag when working (per brand standards). Complying at all times with Hyatt house hotel standards and regulations to encourage safe and efficient hotel operations. Maintaining the cleanliness of all public spaces in the hotel including lobby, exterior, hallways and public spaces. Operating company-owned vehicle focusing on transporting business clientele to physician appointments and other daily errands. Working in various shifts based on the fixed work schedule by the company. Excellent safety record without a single complaint, citation, or accident. 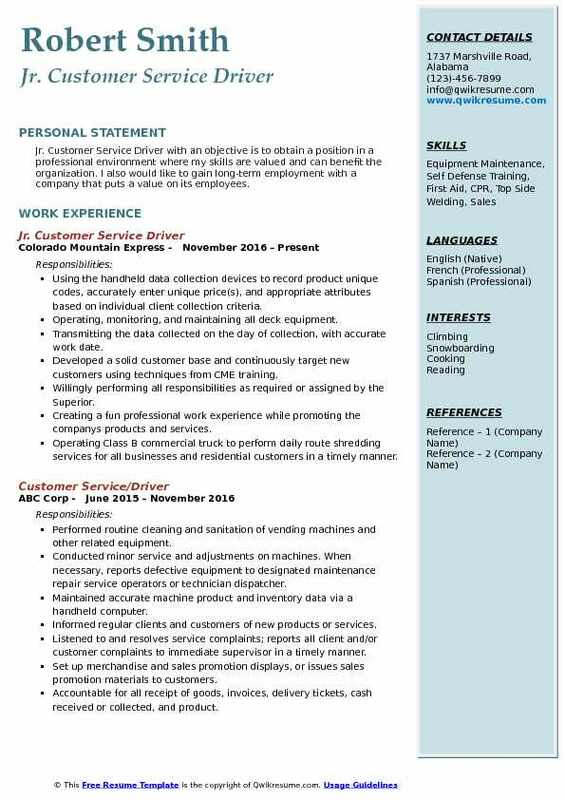 Objective : Customer Service Driver with 3 years of experience and the objective is to obtain a position in a professional environment where my skills are valued and can benefit the organization. I also would like to gain long-term employment with a company that puts a value on its employees. Transmitting data collected on the day of collection, with accurate work date. Developing a solid customer base and continuously target new customers using techniques from CME training. Willingly performing all responsibilities as required or assigned by superior. Creating a fun professional work experience while promoting the company's products and services. Ensuring that the appearance and presentation of the Company’s products and/or equipment at the customer location follows established protocols. Ordering the correct quantity and types of products needed to stock customer accounts to maximize sales and minimize product loss. 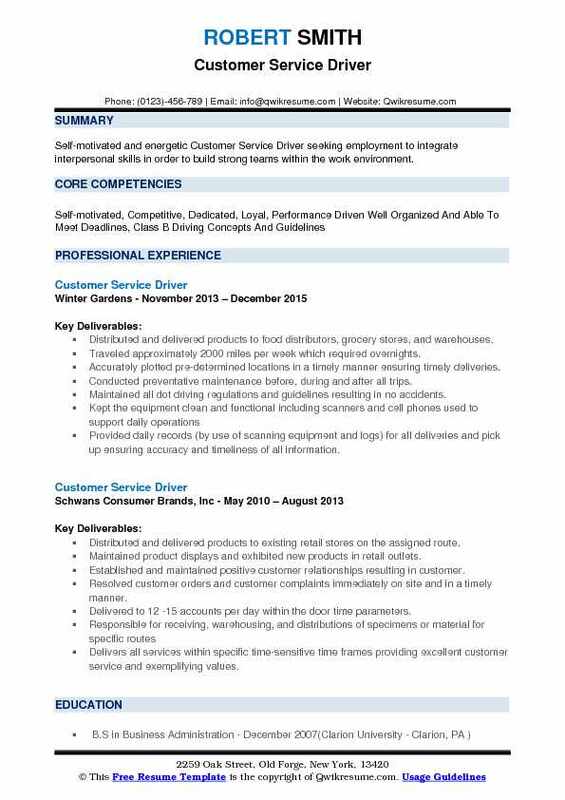 Objective : Customer Service/Driver with over two years experience delivering fragile and hazardous materials throughout the Northeast. Great driving record, including several company awards for safety and efficiency. Ability to use computer technologies to improve delivery scheduling and tracking. Responsible for communicating with multiple auto companies to ensure items requested are validated in the system. Using the state of the art item manager software to approve or decline items on site. Negotiating with the fellow company partners on new ways to receive auto parts more effectively. Providing reports on all items sent to relative N.A.P.A. Shops for record keeping. Assisting the customers over the phone with data entries, scheduled time drops, and balance inquiries. Accurately tracking all units via pickup and delivery logs. Obtain required sign-offs on all units. Building and maintaining the relationships with the customers and team members. 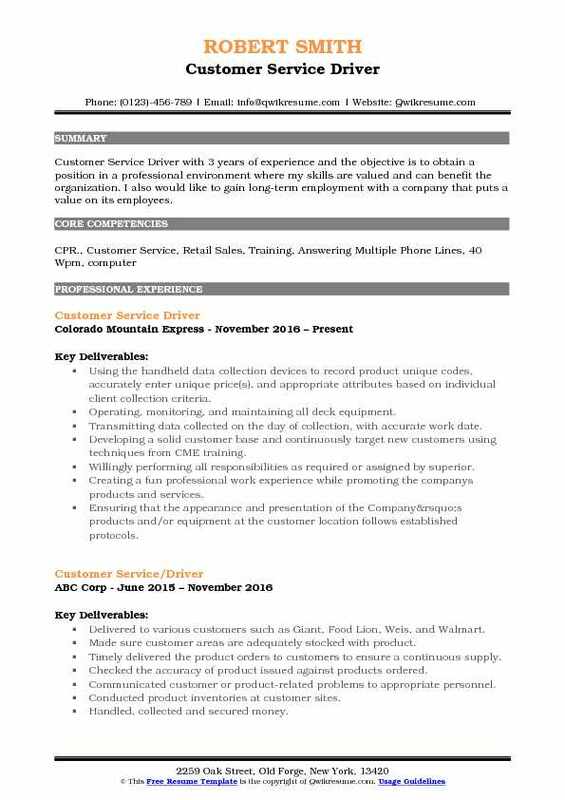 Summary : Customer Service Driver with 18 years of experience looking for a challenging entry-level position that allows me to build rapport and grow long-term relationships with customers. 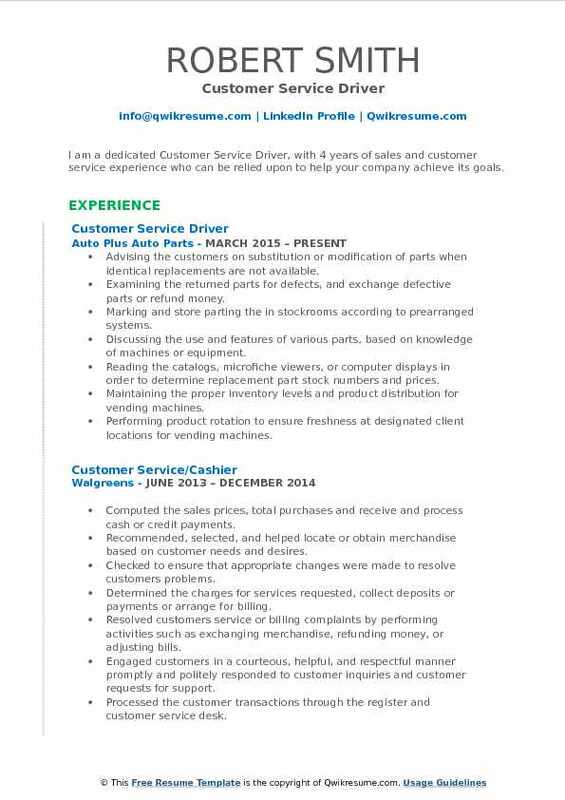 I have fifteen years of customer service experience and I strive to share my experience in a respected organization. Delivering wholesale quality seafood to major and local restaurants/businesses. Mapping and prioritizing multiple routes based on need, demand, and time constraints. Gained customer loyalty for the business by building rapport and trust with all clients. Received top employee satisfaction and praise compared to my coworkers based on client feedback. Deliver food products ordered by commercial account holders to 38 local grocery and retail stores. Keeping the truck clean and organized and in compliance with DOT and Maintenance requirements. Making timely deliveries to customers – placing items to customer specification. Communicated issues to supervisor in a timely manner.